The Avengers International Fan Forum :: View topic - What's your latest Avengers purchase? What's your latest Avengers purchase? I also hope to find an Avengers jigsaw from 1966 Ron. I've got 3 of the 4 New Avengers jigsaws (I just need #1). I still haven't bought a blu ray player yet Denis. I've got the 5 dvd box sets from Studio Canal which I think look great. Does anyone think the blu rays are a major improvement Rich. The blu rays are amazing. Series 4 more than the others as it's had the grain and balance cleaned and corrected. Series 5 and 6 are softer but still great. For me, I can get more detail from the picture (leading me to correct hundreds of licence plates in my transport guide). 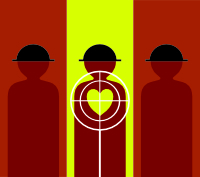 Whether you would notice a great difference on a television while watching is more debatable. I'll just HAVE to do a comparison tonight. That's for sure. On the Blu ray you will be able to see the details in the background more clearly. Personally, I was interested in buying Blu Ray to identify actors and stunt performers. I would be happy for help if anyone knows a Blu Ray player for Windows with the possibility of good zoom. British Blu Rays vs Optimum's British DVDs? Definite improvement but not universally obvious on my 55" set. series 4 (The Dangermakers) Blu ray has superior detail but appears slightly gritty and over sharpened at times. They may have done too much image enhancement on this episode as The Town of No Return looks amazing from start to finish. series 5 (The Superlative Seven) Blu ray has superior detail which is not immediately obvious, definitely a crisper result and amazing detail in Charlotte Rampling hair, for instance. This is probably the best looking series on blu ray on my television. series 6 (Legacy of Death) Blu ray has better detail and you can tell the pattern of Steed's tie accurately but the picture is much darker. This is because the DVDs were over-corrected in brightness, but as the source material has faded you have to bump up the contrast and brightness of the blu ray to get a good picture. Many thanks to Piers for his review of British Blu Rays. Definitely result says that need to buy these Blu Rays if anyone want to watch Avengers episodes, produced on film tape, in high quality for enjoyment and research details. 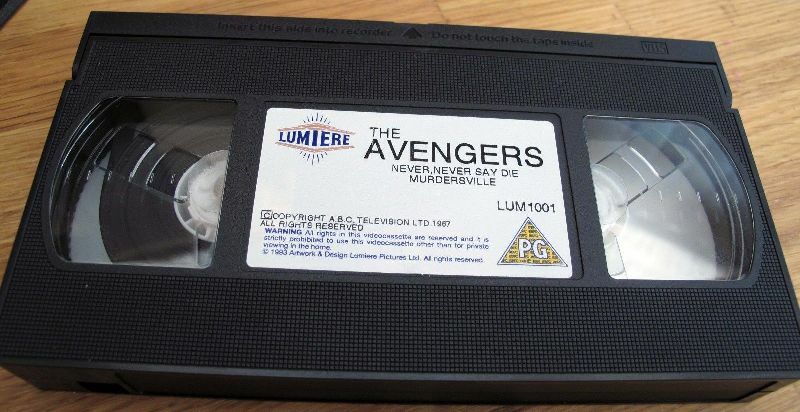 Recently, I bought a rare British VHS - the first Avengers release from Lumiere. It's intended only for hire (starting in the summer of 1993) but in the end you could buy it with special offers. bought some t-shirts...w/ Emma....toooo cool! Recently ordered this DVD box. Note;. Not Macnee and Rigg on cover! 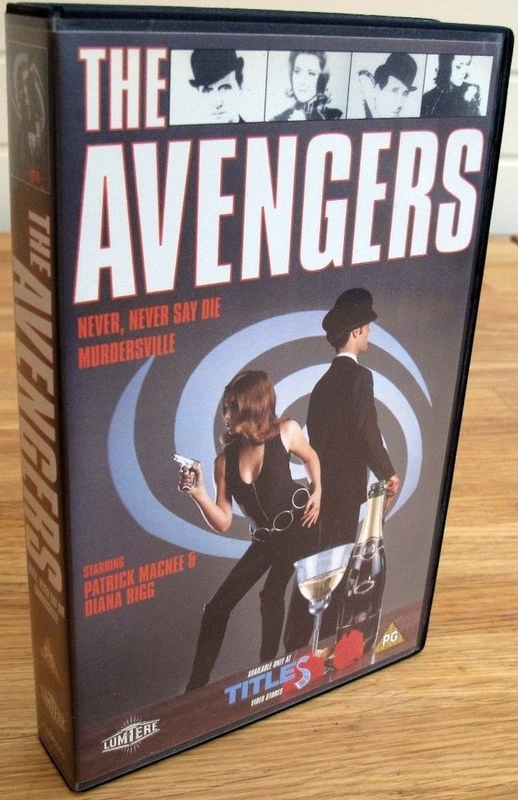 As this was first official UK Avengers VHS edition, was decided to do special photo for the cover. I'll bet you these models also made the silhouettes for the Avengers Retrospective end titles background. I always thought that cover looked like two women ! Spot on! Steed appears to have his hair up in a bun. I wonder why they did a new shoot rather than use the original publicity stills. I did buy this video back in the early 90's and I never noticed at the time that it was a female model posing as Steed. I can see it clearly now! I actually took my video back for a refund as there is an audio problem with all copies of this video,the problem being that the audio is so quiet you can barely hear it. Not a problem now though as you wouldn't buy this to play it, you'd buy it because it's a nice piece of memorabilia. Yes, really, it could be a female model for Steed - I will do a scan of the cover when I get it. If you bought it in a video store or at least you saw it on sale in the early 1990s - this will be a great discovery for me and some other Avengers fans. Personally, I thought for many years that it was just a tape for rent. Denis, I seem to remember it was only for sale in one branch of video hire store. I can't remember the name of the video store now. I'm sure I read about it in Stay tuned, Dave Roger's old fanzine which I used to buy. I'll look through these and let you know. What I do remember is how expensive this video tape was! It was £20, roughly double the price of the Lumiere videos which came out about the same time. I did take this video back as I've said, but I've kept all my other videos, including the brief case edition and the Tara King box set which Linda Thorson signed for me! Rich. Many thanks, Rich. I remember the information from Stay Tuned about, as it was only for sale in one branch of video hire store - sort of special offer. A good gift for fans - possibility to buy a tape intended only for rental. 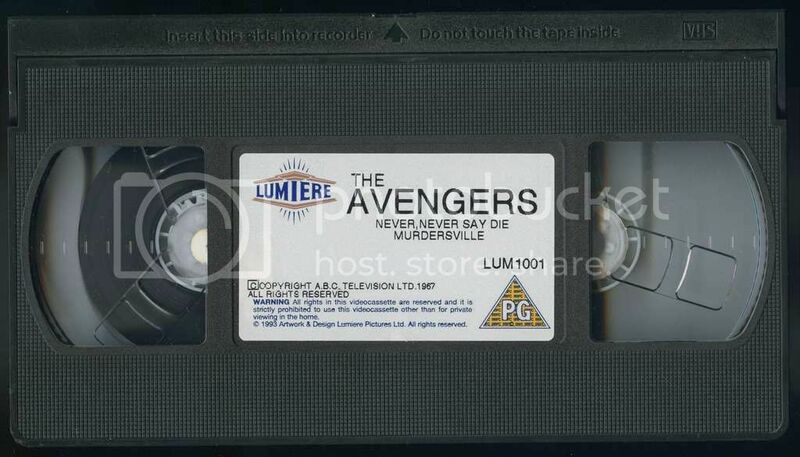 First official UK VHS with The Avengers! 20 pounds is impressive at the time, although I guess there were many who wished. It is good that later they lowered the price for future VHS issues. Glad to hear, Linda Thorson signed Tara King box set for you. Unforgettably. I recall photos from that event. There were posters from Lumiere. I always wonder whether they were sold or are just used as an advertisement? I have never seen it on sale at auctions, online stores and private announcements. I never saw that video in the flesh. Those episodes eventually came out in the Emma Peel Boxset (the Tara King boxset had a much better designed packaging). Ah the Lumiere videos make me feel all nostalgic for a time when all I knew of an episode was the one picture on the back of the video and was agonise over which video to buy next with my pocket money. Recently I got french DVD box and first official UK Avengers VHS edition. Tomorrow I will do scan of VHS cover and tape. Scan of cover from first official UK Avengers VHS edition is online now (on Steedumbrella). I checked the episodes, the quality is not so bad. All episodes look complete according to their timing and include the intro "The Avengers in Color". 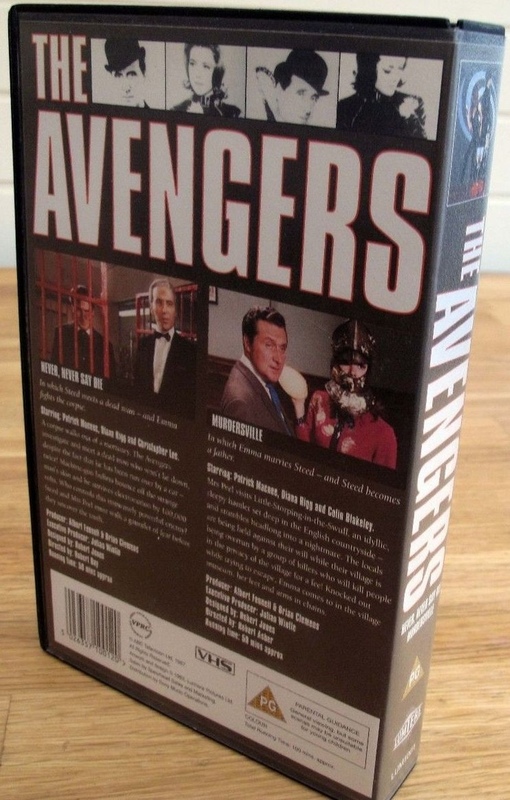 DVD box "The Avengers Series 4 - Australia (1965)", I ordered earlier, is already in USA stock. If everything goes under the standard procedure, I will get it by next month. Bought two Avengers items this week. The first was Big Finish's The Avengers The Comic Strip Adaptations volume 3, which I'm hoping to listen to this weekend. 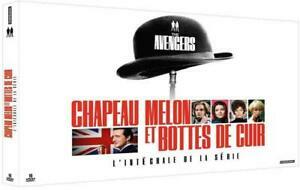 The other was the Laurie Johnson album Music from The Avengers, The New Avengers and The Professionals. I just have to buy something to play it on now!